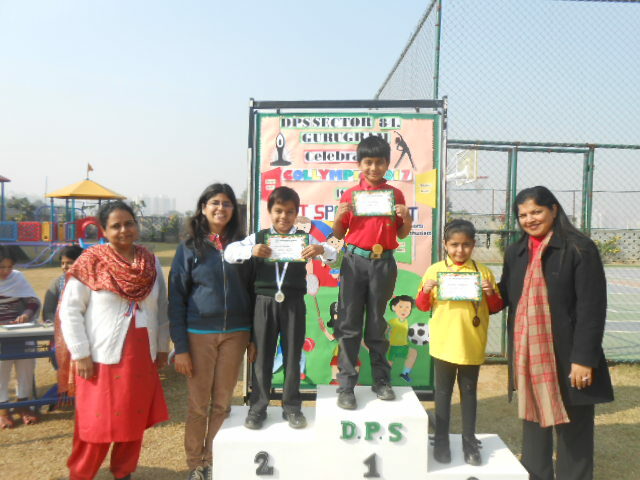 DPS, Sector 84, Gurugram conducted its Sports Week ‘Collympics’ from 18th – 22nd December. 22nd December, 2017 was the culmination of the Sports Week and was a day filled with fervour and excitement. Bright clear and sunny sky accompanied by pleasant weather was the perfect boost for the students and they entered into the spirit of the occasion in a grand way. The much awaited Annual Sports Day commenced with the oath ceremony administered by our School Sports Captain. The Principal declared the Sports Meet open and appreciated the impressive March Past of the students, which was a magnificent display of discipline, coordination and the impeccable synchronization of all the four houses. An energizing exercise drill, yoga as well as aerobics presentation set the tone for the rest of the events. Once the races began, the air was filled with cheering and tones of encouragement for the young athletes. Rabbit race, Jelly fish race, Pack your bag race, Shuttle run with ball race, Hawaiian race were some of the races conducted for the students of Nursery and K.G. Students of Grade I took part in Obstacle race. Heats for the relay races were done over a period of one week, in which the students were shortlisted for the final round. Students from Grades III to VII also participated in football, badminton and cricket matches and the final list of the players was prepared. Those shortlisted played the final matches. Grades II to VII competed house wise in events including 100 m, 200 m, 200 m relay races, a highly competitive event where the four houses eyed for the first place, competed with great stamina and vigour, trying to gain more points for their respective houses. Fun time with three legged race by the teachers of the school, added enjoyment to the event. The day ended with distribution of medals and certificates to winners by our honourable Principal. Keeping in sync with the theme, our school, DPS Sector 84, Gurugram, celebrated its first Science Week in school from 4th December to 8th December, 2017. The aim of celebration was to enthuse students and get them involved in the global scientific perspective as well as stimulate their understanding of how science impacts their future and daily lives. Knowledge seemed to flow in the form of informative charts, decorated all over the school building. Week long activities provided all students with the opportunity to develop abilities of scientific inquiry. Students of Nursery and K.G had their own share of participation. They were shown experiments on themes like sink and float, lifecycle of a butterfly, concept of light and heavy, inflation and deflation and living and non living things. 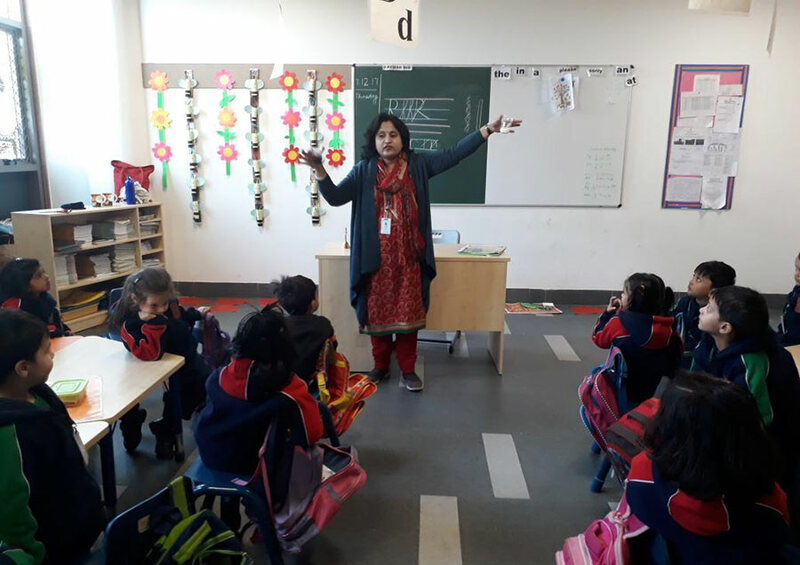 Grade I & II enjoyed the fun skill-oriented activities like making of pin wheel, making a parachute, scrap book on plant products, model of Our Solar System, etc. Grade III prepared attractive herbariums, Grade IV conducted special assembly on ‘It looks like magic, but it’s really science at work!’ and created simple machines. Grades V, VI & VII made models and took pride in displaying them with great enthusiasm. They explained the science and the concepts behind their working models. To foster the scientific knowledge of students, they were shown some experiments related to pressure, density of water, experiments related to principle that air exerts pressure and so on. And last but not the least, to test their knowledge of science facts, an Inter House Grey Matter Quiz competition was organized for grades III to VII. Mother Teresa house bagged the first position with Mahatma Gandhi securing second place. The week culminated with the thought that science is a beautiful gift to humanity and hence we should not distort it. It was a week of fun based learning experience.